They rock both on and off stage – talented rock singers, fashion and style icons and yummy mummies (not all of them but some) – these girls are too hot to be real! 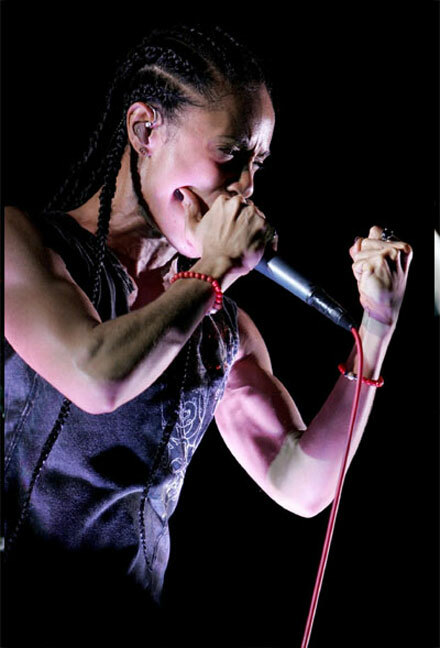 Did you know Jada Pinkett Smith used to be a metal rocker and performed in the band called Wicked Wisdom? Jada joined the band in 2002 and their debut album was released four years later. Now successful actress and mother of two rising stars says she used to be mocked when she played metal music. When I played metal music, I was mocked. I got death threats when I was added to the Ozzfest lineup but I stuck with it. At the end of that, people got on board. Me doing metal was one of my biggest learning experiences,” Jada Pinkett Smith said. Must confess, Jada makes a pretty hot rocker despite all those big muscles and the growling voice. We know her as a super yummy mother of two, successful fashion designer and solo artist. Gwen Stefani started her career in No Doubt (the band is now reunited) and used to be a full-time rock girl until the band went on hiatus in 2004. We’re looking forward to her major comeback as an all-grown-up hot rock babe! I remember the first time I heard Amy’s voice about ten years ago – I was stunned by its originality, purity and power. Amy Lee is definitely one of the hottest rock girls of the past decade both because of her looks and her talents – she’s a vocalist, pianist, songwriter and a winner of the Songwriter Icon Award by NMPA (Nation Music Publishers Association). As a woman I feel offended because these artists portray women as people that can only do well in the world by selling their bodies. I’m determined to help prove that to be false,” Amy Lee said in one of her interviews.